Since you already know how to Create a Project from scratch, now it’s time let Demand Metric do your job for you, and look like a rockstar! You don’t always have to create a project using a blank slate, simply launch one of our Smart Projects - pre-built project plans, with all the tools, training, and resources you need to hit your next project out of the park. To get your Smart Project started, simply click on the “Create a New Project” button, and you’ll see the list of Smart Projects along the left-hand side. Similar to creating a project from scratch, you’ll need to give your project a title and a colour, but instead of launching and doing all the work yourself, simply click on the relevant Smart Project. 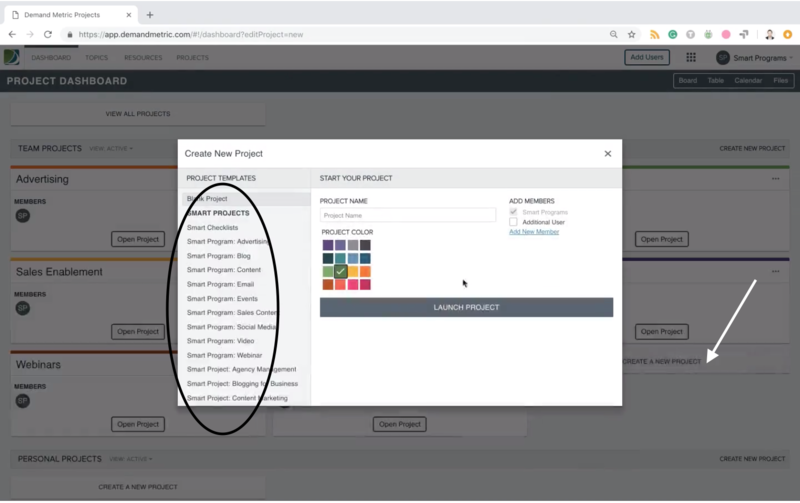 For example, if you’re working on your marketing plan, you could title the project 2019 Marketing Plan, choose a colour, and then click on the Smart Project: Marketing Plan. Click “Launch Project,” and voila, all the steps, tools, training and resources you could ever need to launch an amazing marketing plan is all in there. All you have to do is get started! Interested? Learn even more about How Smart Projects Work.